The folks over at Reinvigorate have just pushed out an email announcing their latest endeavor. 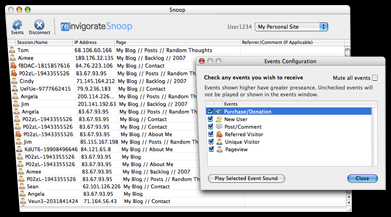 Snoop is a downloadable application for Mac and Windows which keeps you updated on the latest user activity on your site (provided that you have an active Reinvigorate account). It features an live-updating list of recent visitors, and a really interesting method of tracking comments and even product purchases, which can be easily implemented with a little scripting knowledge. Similar to the Mint Doorbell Pepper, Snoop features a variety of sound effects which alert you of either a new unique, returning or referred visitor, a product sale or a comment. This little application really has boosted my confidence in Reinvigorate, and I’m sure to be as addicted to it as I was to the Mint Doorbell Pepper, at least for a week or so… *ding* Oh vanity!